Ingredients: Organic Spirulina, Organic Soya Beans, Organic Linseed, Organic Chick Peas, Organic Lentils, Organic Rice, Organic Adzuki Beans, Organic Alfalfa Grass, Organic Alfalfa Seed, Pepitas (Pumpkin Seeds), Organic Sunflower kernels, Organic Mung Beans, Organic Ginger, Organic Agave, Organic Molasses (These ingredients are grown organically without the use of any toxins, chemicals, pesticides, or insecticides. They do not contain genetically engineered ingredients, artificial coloring, flavoring or preservatives. No animal or clinical testing. 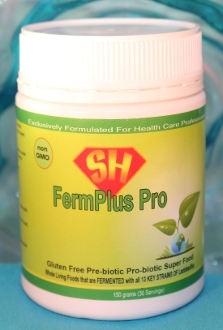 FermPlus Pro is one of the few probiotics that colonize good microbes in your system which increases the nutrient content. The ingredients in FermPlus Pro are fermented, so they have been partially broken down which allows them to be more available for assimilation. It cleanses Candida yeast fungi overgrowth and parasites. It is an organic whole food supplement. To take, add one tablespoon of FermPlus Pro to eight ounces of room-temperature water, drink quickly.